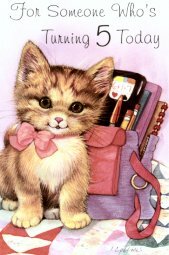 The cute kitten on the front of this birthday card sends greetings to someone who is 5 years old. Inside: "To hope that you have lots of fun, and lots of games to play and lots of friends to share it all. For you are 5 today! Have a Very Happy Birthday". Envelope included.